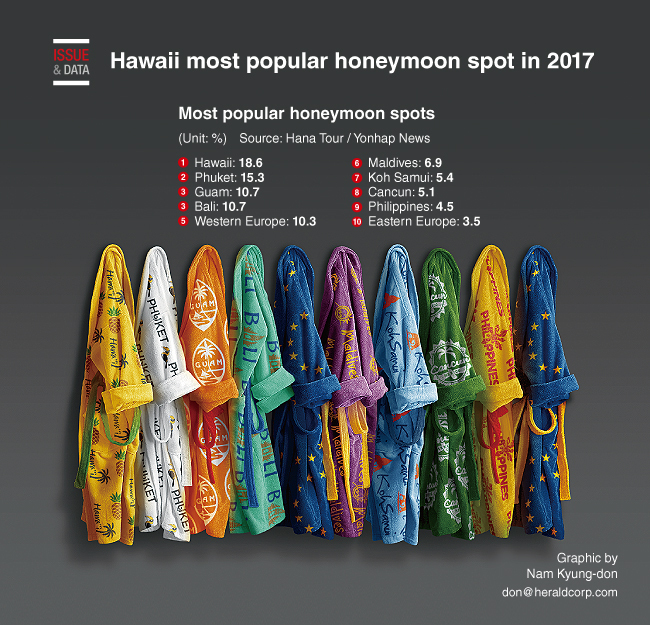 Hawaii was the most popular destination for honeymooners last year, trailed by the Thai resort island of Phuket, a travel agency said. About 18.6 percent of 19,000 honeymooners, who bought group tour programs offered by Hana Tour last year, chose the US resort destination, according to the biggest travel agency in South Korea. Hana Tour attributed the popularity of Hawaii to the fact newlyweds can enjoy a variety of sightseeing, shopping and aquatic sport options in Honolulu on Oahu and several other islands. Phuket came in second at 15.3 percent, followed by Guam and Bali, both at 10.7 percent.